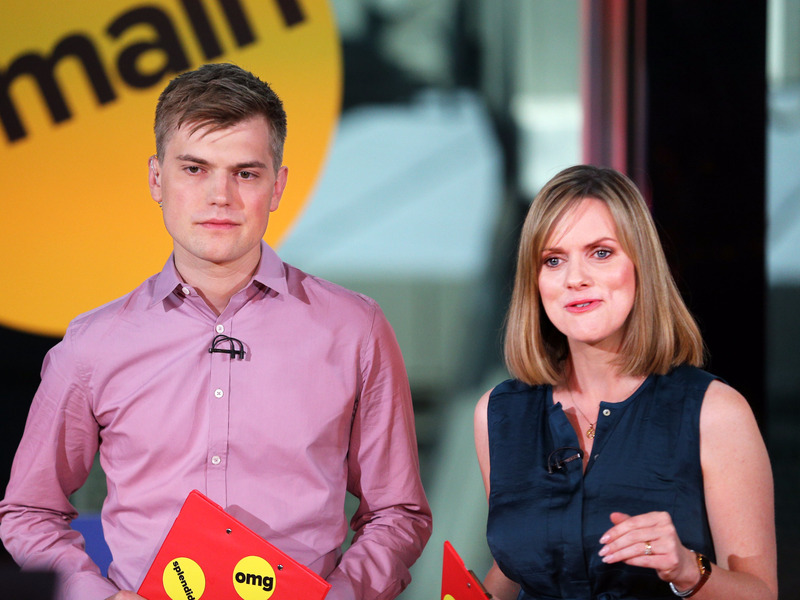 GettyBuzzFeed’s Jim Waterson and Emily Ashton during the website’s EU referendum debate last year. BuzzFeed to layoff more than 40 of its 140 British staff. Twenty-three journalists will be let go. BuzzFeed UK’s wage bill stands at £10 million. The website’s audience has dropped 20% in two years, according to Comscore. BuzzFeed is about to make just under a third of its British staff redundant as part of a cost-cutting programme. The website’s London workforce was briefed on the plans on Thursday evening. In a tweet later confirmed by the company, media and politics reporter Mark Di Stefano said 45 of the bureau’s 140 editorial and commercial staff will lose their jobs. That is more than double the number mooted last week. Editor Ben Smith said “20 staff will be let go in London,” according to Di Stefano, as part of plans to make 100 layoffs in both the US and Britain. The spokeswoman said BuzzFeed would remain committed to quality journalism. “Under our proposal we will continue to pursue great journalism and reporting in global coverage, politics, media, social justice, world news, and investigations,” she said. It comes against a backdrop of missed revenue targets. BuzzFeed has come in 15-20% short of its $US350 million (£260 million) goal, dampening prospects of an imminent IPO. BuzzFeed UK is growing, however. Revenue more than doubled to £20.5 million (£26.8 million) last year, according to documents filed at Companies House. During that time, its wage bill also doubled to nearly £10 million. 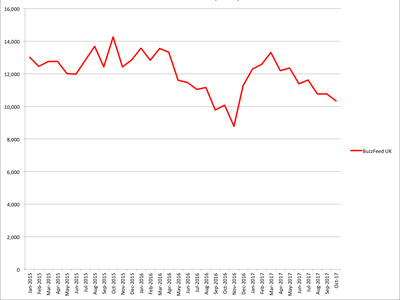 But Comscore data reveals a 20% decline in BuzzFeed UK’s unique users over the past two years. 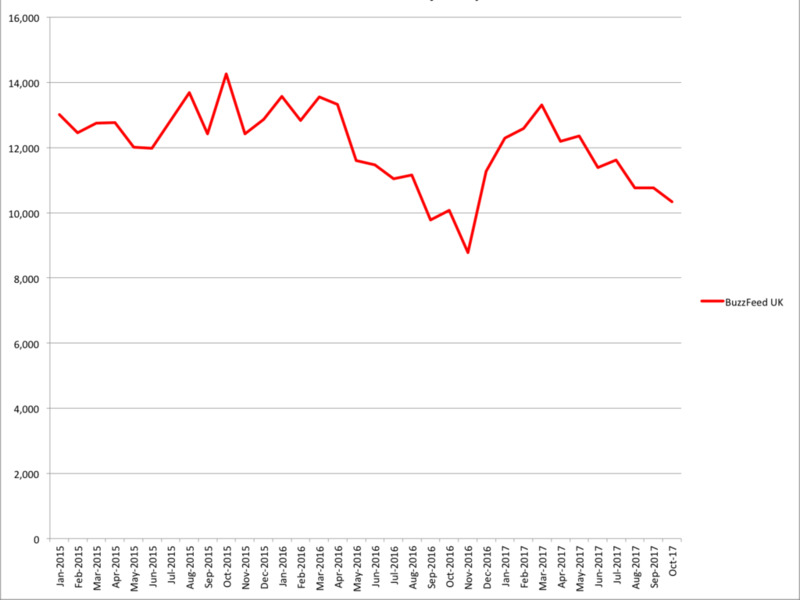 The chart below shows that BuzzFeed’s British traffic has fallen from 13.01 million uniques in January 2015 to 10.3 million in October this year – despite its audience rallying in the early months of 2017. BuzzFeed boasts high-profile journalists including editor-in-chief Janine Gibson, politics editor Jim Waterson, and investigations editor Heidi Blake. It has become known for its original reporting, such as its 2016 exposé on RBS’s systematic mistreatment of small businesses and, more recently, the sexual harassment allegations against Labour MP Ivan Lewis.